Lai completed his registration for the presidential primary around noon at the DPP headquarters in Taipei. Responding to comments that his decision to compete against President Tsai Ing-wen (蔡英文) may cause divisions in the party, Lai said the DPP has a democratic primary process that will not be divisive. 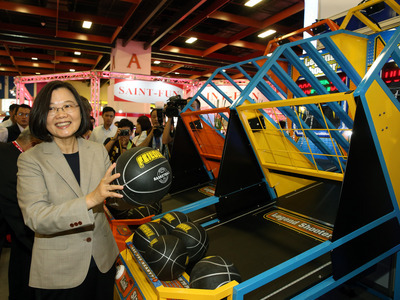 Tsai has announced her decision to seek reelection and is expected to register for the DPP primary later this week. In the 2020 presidential elections, the DPP will be in an even more precarious position than it was in the 2008 race, particularly after its heavy losses in the local elections in November 2018, according to Lai. The DPP's grassroots supporters are worried that not only would the party lose the presidency and its majority in the Legislature, but the country's sovereignty and democracy would face unprecedented challenges, Lai said. He said Taiwan has been in a very difficult position since Chinese President Xi Jinping (習近平) unveiled his policies on Taiwan on Jan. 2, which included a push to annex Taiwan, a declaration that the "1992 consensus" was essentially the "one China" principle, and a proposal of a "one country, two systems" formula to achieve unification with Taiwan. Lai, who resigned as premier on Jan. 11 to take responsibility for the DPP's crushing defeat in last year's local government elections, said he felt he should have the courage and accept the responsibility of safeguarding Taiwan and therefore had decided to throw his hat into the ring for the party's presidential primary. He said the 2020 presidential election is crucial to Taiwan's future, if it wants to maintain its status as an independent, sovereign nation and preserve its values of freedom, democracy and human rights. On the question of whether he will run alongside Tsai on the DPP ticket if he loses to her in the primary, Lai did not give a direct answer. "If I lose, I will throw my support behind President Tsai," Lai said, adding that the loser must back the winner in the spirit of democracy. If he wins the DPP nomination and comes up against Kaohsiung Mayor Han Kuo-yu (韓國瑜) of the Kuomintang in 2020, they will engage in a fair competition, Lai said, adding that Han is one of the most remarkable political stars of the century.